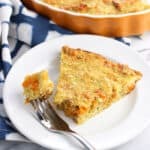 This easy sweet potato zucchini pie features sweet potato chunks, onion, and cheese with a crunchy panko topping. It makes its own crust as it bakes for a simple brunch, lunch, or dinner recipe. Preheat oven to 350°F and grease a 9" pie plate. Add 1 tbsp of butter and 1 tbsp olive oil to a skillet set over medium heat. Once the butter melts, add sweet potato cubes and let cook for 10 or so minutes, stirring them around in the skillet so that all sides begin to brown evenly. Once golden and softened, remove skillet from the heat and cover it. The potato cubes will continue to soften as they cool. Melt remaining 3 tbsp of butter and set aside. Beat eggs in a large mixing bowl. Add remaining 3 tbsp of melted butter, Worcestershire sauce, minced garlic, salt, pepper, and hot sauce. Stir. Stir in Bisquick until just combined. Stir in onion, zucchini, sweet potatoes, and Parmesan. Pour egg mixture into the prepared pie plate and even scatter panko breadcrumbs over top. Bake for 40-50 minutes, or until edges are golden brown and the center has set. Let cool for 10 or so minutes before slicing.